Luren Singing Society banner embroidered by Pauline Fjelde and Thomane Fjelde Hansen, Minneapolis, Minnesota, 1902. Height, 70 inches; width, 47 inches. Vesterheim 1993.001.001 – Gift of Luren Singing Society. Sangerfest 2018 is coming to Decorah on May 31-June 2, 2018! This vocal extravaganza is a gathering of the Norwegian Singers’ Association of America (NSAA), which was founded in 1897. This time, it’s hosted by the popular Decorah men’s chorus, Luren Singing Society. This year is Luren’s 150th anniversary! Luren was the first Norwegian men’s singing society in America and is currently one of the largest in the country. During Sangerfest, Vesterheim is presenting a special five-day display of Sangerfest memorabilia and Luren Singing Society history. Anyone visiting the museum from May 30-June 3 is welcome to take a look. The display will include music group banners, badges and ribbons, Luren caps, historical photos, and more. Vesterheim is the official repository of Luren Singing Society archives and small artifact collections. We house two Luren banners, but one is too fragile to be displayed and the other is currently away being conserved. 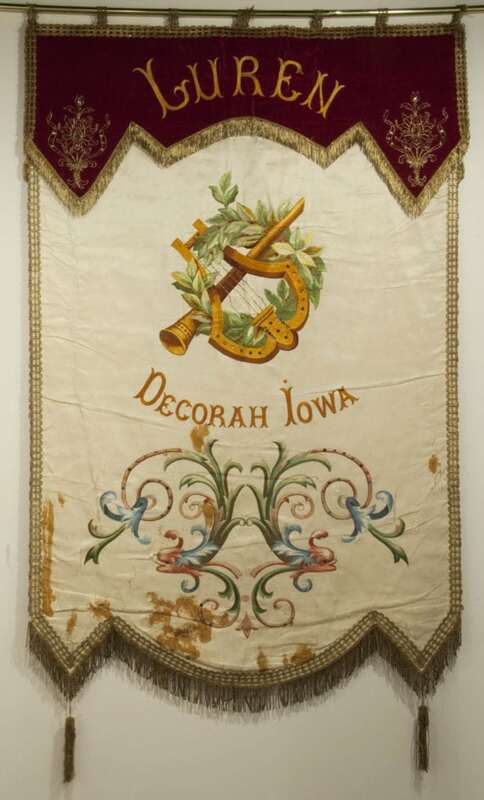 The Fjelde sisters made this second banner in 1905 in Minneapolis and they are known for embroidering the first Minnesota state flag in the 1890s. The 2018 Sangerfest Grand Concert will be in the Center for Faith and Life at Luther College on June 2, 7:00 p.m. During the concert, over 200 men from ten Midwest Norwegian-American male choruses will blend their voices to sing Scandinavian and traditional and contemporary American choral pieces.